Adapted from my original article as Food Contributor at City Farmhouse. Check that out ova here! My Cousin Vinny quotes it best, “No self-respectin’ Southerner uses instant grits. I take pride in my grits.” I do declare, my kind sir, as do I. As do I. Ever since I caught the grit bug, never have I ever turned back. Charleston is where I fell madly in love with the silky-smooth, Southern delicacy that is grits. Chris and I stayed at the 1837 Bed & Breakfast with the most amazing morning meals. Our last morning, there was one breakfast spot we had to try. At Hominy Grill, our waitress approached to take our order. Of course, I request my newfound fave, to which she asked, “Would you like cheese in those grits?” Curious as we are, we ask her preference. Well, her Mama always put cheese in her grits, so we duly obliged. The impending hominy love affair was sealed. We’ve been hankering to get back down to Charleston. Strolling the CitySeed farmer’s market, it dawned upon me this was the last week for a seasonal specialty: ramps. 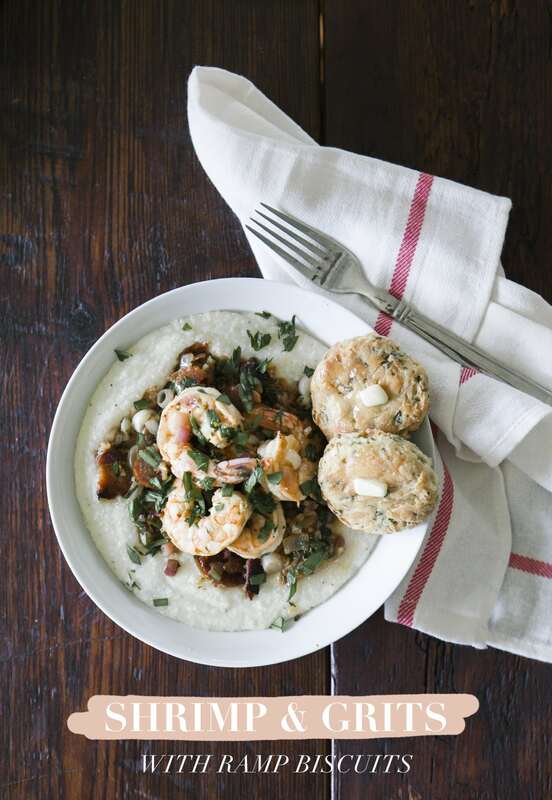 That and a yearning for authentic Southern cuisine, it made quick sense … shrimp, grits, and ramps are a match made in heaven. What the heck are ramps? They’re a peppery, crunchy, garlicky, oniony green that thrive on the forest floor as the weather warms until the leaf layers thicken, typically from late-April until mid-May. 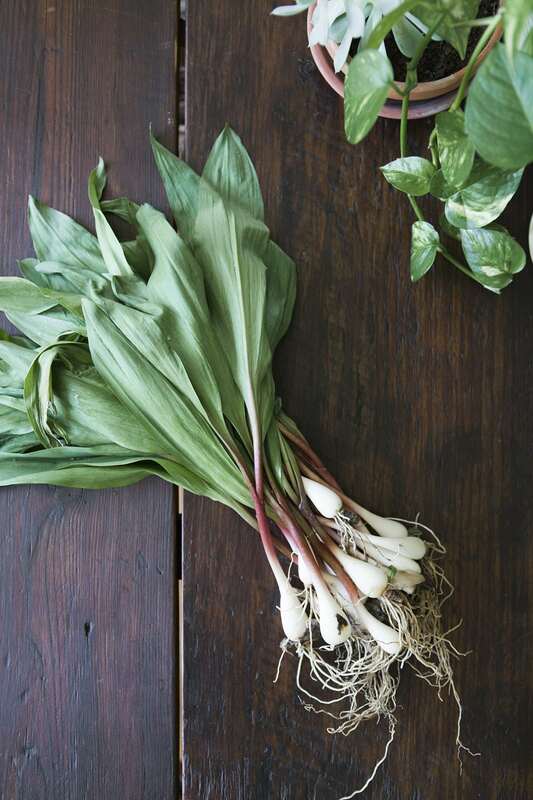 Call them ramps or a variety of their epithets – wild leeks, spring onions, wild garlic; the list goes on! Waldingfield Farm is the local purveyor of ramps and they never disappoint. Ramps are delicious served raw, grilled, pureed, and in so many ways. It would be sinful to only sauté. This Southern-inspired shrimp & grits recipe uses ramps not two, but three, ways: raw, sautéed and best yet, freshly baked. One you bite off a piece of this ramp biscuit, you’ll be hankering for next spring. Preheat the oven to 425 degrees. Combine all dry biscuit ingredients in a large bowl and whisk together. Add cold butter. Using a pastry cutter, mix into a coarse texture. Make a center well. Add milk and ramps. Roll into a wet dough ball. While grits are simmering, marinate shrimp in ¼ cup lemon juice, sriracha, salt and pepper for 10 to 20 minutes. Roll dough out 1.25-5 inch deep. Cut your biscuits using a cookie cutter or small jar. 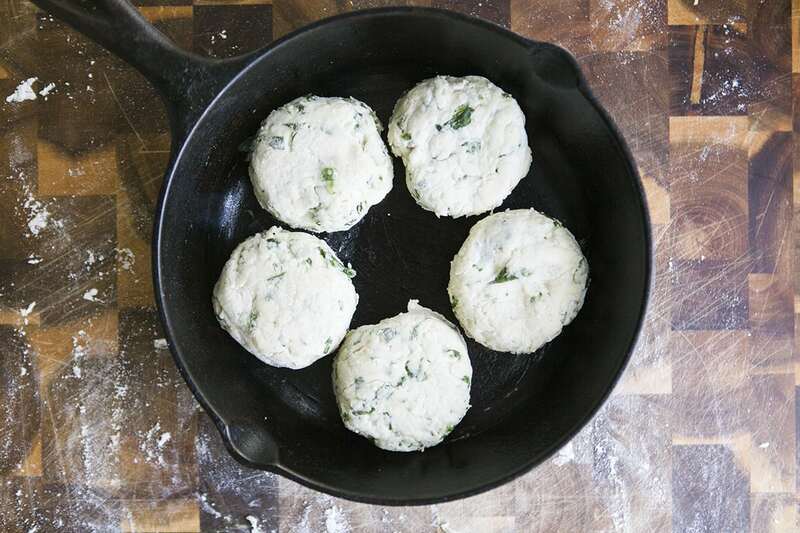 Place on a cast iron skillet or baking sheet. Bake for 15 minutes until risen and golden brown. Let cool on a metal rack. In a cast iron skillet on medium-high heat, sauté bacon until crispy. Remove and wipe pan clean. Rest on a paper towel to soak up excess grease. Add Andouille sausage slices and brown on both sides. Remove and wipe clean. Crumble bacon. In the same skillet, add butter, chicken broth and a dash of lemon juice. Let thicken for 1 to 2 minutes. 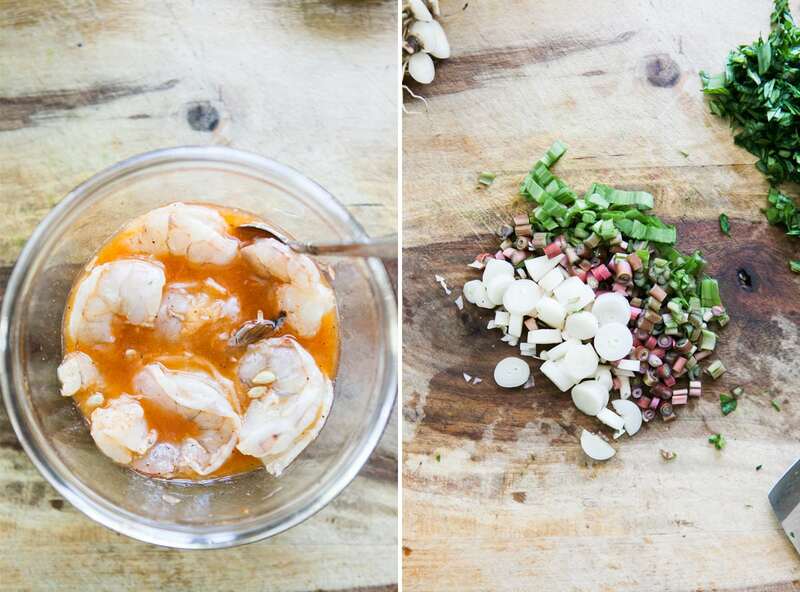 Add shallots, ramps, garlic, and shrimp. Sauté for 2 minutes. Add bacon and sausage. Cook for 2 minutes. Remove from heat. In a wide bowl, plate grits and lather with shrimp mixture and broth, top with tail-on shrimp, and garnish with ramp greens. Butter your biscuits and serve.